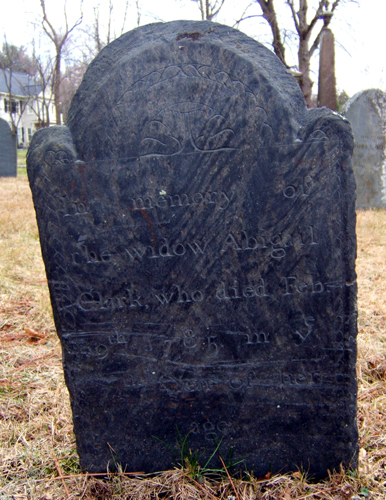 Mary (Boyden) Guild (1708-1776) is #279 on my Ahnentafel List, my 6th great-grandmother, who married #278 Nathaniel Guild (1712-1796) in 1733 in Dedham, Massachusetts. Mary Boyden was born 9 February 1707/8 in Wrentham, Massachusetts, the first child of Thomas and Deborah (Wight) Boyden. Mary Boyden "of Wrentham" was married by John Metcalfe to Nathaniel Guild "of Dedham" on 12 June 1733 in Dedham, Massachusetts. They had four children between 1735 and 1752, all born in Walpole, Massachusetts. Mary's father, Thomas Boyden, died testate in 1770. In his will, written 5 July 1765 and proved 10 October 1771, he bequeathed 13 pounds, 8 shillings and 6 pence to his daughter "Mary Gile." Mary Guild died on 20 March 1776 in Walpole, Massachusetts. Her husband, Nathaniel, died in 1796 in Walpole[4-5]. here are no burial records for Mary (Boyden) Guild in Walpole, Wrentham or Medfield, Massachusetts. 1. Thomas W. Baldwin, Vital records of Wrentham, Massachusetts, to the year 1850 (Boston, Mass. : Stanhope Press, 1910), Births, page 34, Mary Boyden entry, `1708. 2. Don Gleason Hill (editor), The Record of Births, Marriages and Deaths in the Town of Dedham,1635-1845 (Dedham, Mass. : Town of Dedham, 1886), page 60, Nathll Guild of Dedham and Mary Boyden of Wrentham entry, 1733. 3. Suffolk County (Massachusetts) Probate Records, 1636-1899, Family History Library, Salt Lake City, Utah; on 435 FHL Microfilm Reels, "Volumes 69-71, 1770-1772," accessed on FHL US/CAN microfil 493,882, Volume 71, pages 17-18, Thomas Boyden will and letters testamentary. 4. Vital Records of Walpole, Massachusetts to the Year 1850 (Boston, Mass. :New England Historic Genealogical Society, 1902), Deaths, page 203, Mary Guild entry, 1776, "wife of Nathaniel". 5. Massachusetts, Town and Vital Records, 1620-1988, digital images, Ancestry.com (http://www.ancestry.com), "Walpole Births, Marriages and Deaths," (image 331 of 2213), Mary Guild entry.